Cartridge Solenoid Operated Valves fit our unique designed cavity. This truly differentiated design allows much larger drill diameters; passage sizes into and out of the valve are maximized, resulting in lower oil velocities and pressure drops. And our solenoid operated cartridge valve advantages are free floating subassembly tolerates eccentricity between cavity threaded and cartridge nose. 1. Equipped with continuous-duty rated coil. 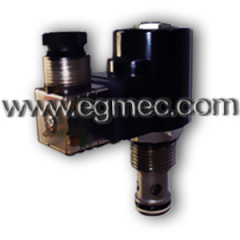 Group of Cartridge Solenoid Operated Valves has been presented above, want more	Cartridge Solenoid Operated Valves and Cartridge Type Solenoid Operated Control Valves, Please Contact Us.